These frozen treats will be a hit with the children! 1. Peel the 3 bananas and cut each one in half. Place in the freezer. 2. Melt the dark chocolate into a bowl over a pan of simmering water, until runny. Set aside and leave to cool slightly. 3. 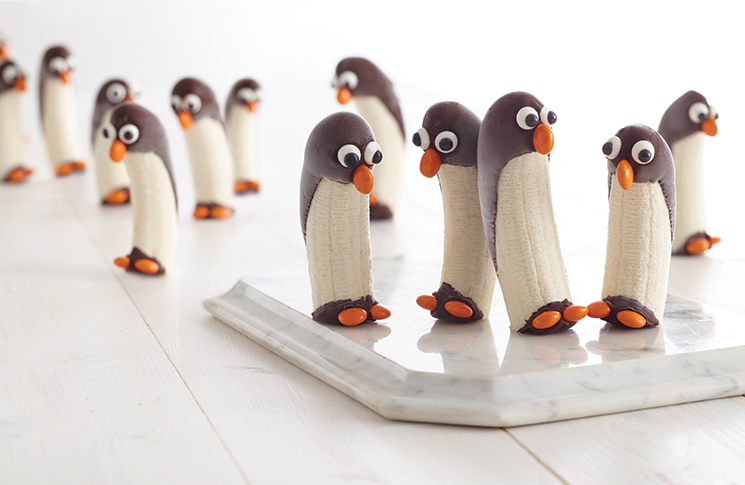 To make the penguins’ eyes, roll out small balls using the ready-to-roll icing. Pipe the pupils onto the eyes using the chocolate icing pen. 4. Once completely frozen, remove the bananas from the freezer. 5. Dunk the top half of the banana into the melted chocolate, gently rolling so you get a longer coating on the back. Dunk the bottom of the banana in the chocolate to create the ‘feet’. 6. Carefully stick on the eyes and do the same with the M&Ms for the nose and two for the feet. 7. Place back in the freezer briefly to set the chocolate, then serve!